Recently, a team of experts headed by Dr. Schwartz have completed a 2-year long project to recreate the appearance of George Washington. Using computer imaging and forensic techniques, a more accurate picture of the first president has been constructed than what is normally seen in paintings and on the dollar bill. 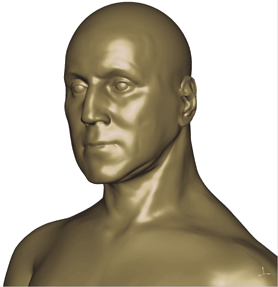 Dr. Jeffrey Schwartz was asked to make the first forensic reconstruction of George Washington. Part of a new education center at Mount Vernon, the project calls for full-length figures of the first president at the ages of 19, 45, and 57. The skeletal remains could not be used to furnish clues. A statue, portraits, a life mask, dentures, and clothing - all from the later stages of Washington's life - constituted the available evidence. A special three-dimensional computer program allowed Dr. Schwartz and his colleagues to combine and manipulate these clues to arrive at the three lifelike reproductions. USA Today - Science to unveil "the real George Washington"